What is the EAV Bible? - READY... SET... QUESTION! Have you heard about the EAV Bible? Does the idea of a Bible that affirms evolution seems confusing? Well, don’t be confused any longer. I created the EAV Bible and it is no more of a “Bible” than the Camping Bible or the Bacon Bible. Yes, these are real books too! The Evolution Affirming Version or the EAV Bible is just a book that has Bible in the title. I wrote it because there are many believers that are being misled into accepting the idea of God using evolution to create. The worst part is that many seminaries across the country are teaching Theistic Evolution to their future pastors and church planters! ARGH!! Yikes, this is actually happening and it is CRAZY. According to a 2017 Gallup Poll 38% of Americans wholeheartedly agree God used evolution to create. This stance is called theistic evolution. My book, called the EAV Bible, shows what the Bible would be like if evolutionary explanations were affirmed. In doing so, scriptures from the authentic Holy Bible are completely omitted. 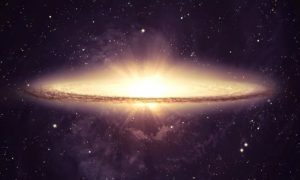 Yes, God is all-powerful and He could have easily used evolution to create the Universe, the Earth, and all living things including humans, but He didn’t… and we know that God did not use evolution for two reasons. First, biologists unanimously agree that an accurate description of evolution involves zero supernatural phenomena. Those who believe God used evolution to create have an inaccurate understanding of biological evolution. The idea of supernatural forces playing a role in the process of natural selection is not only an oxymoron, but is in direct conflict with a modern understanding of evolutionary biology. Second, Judeo-Christian scripture repeatedly details creation taking place via supernatural phenomena. Every biblical reference to the formation of the Universe, Earth, and biodiversity point to miraculous events. Not a single verse in all of ancient scripture suggests anything coming into existence via natural processes. Those who believe God used evolution are in direct conflict with all biblical references to creation. The only way theistic evolution can be seen as an accurate description of how God created is to ignore and exclude authentic scripture. There is no “happy medium” in the conversations of origins. Complex biological systems exist. Life is diverse and abundant. Yet, how this took place be can only be explained by means of natural or supernatural processes. These are the only two options. Trying to blend natural and supernatural processes is logically and theologically bankrupt. No honest person is able to give good reason for subscribing to the idea of God using evolution to create. Theistic evolution, not only, requires a false understanding of biological evolution, but also requires a multitude of Judeo-Christian scriptures to be untrue. The EAV Bible was written for purposes of illustration, and is by no means an accurate reflection of God’s Word. Authentic scriptures of the Judeo-Christian narrative are the only true Bible and this book should never be mistaken as such. 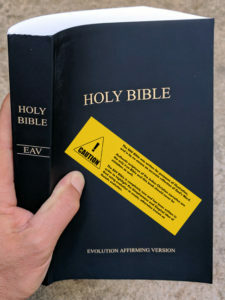 The EAV Bible is completely new and has been written in order to highlight the blasphemous and illogical idea of God using evolution to create, otherwise known as theistic evolution. Learn more scientific and theological ramifications of theistic evolution by watching my SHORT FILM. There is no honest way to value the Bible while adhering to the idea of evolution. There is no point in reading scripture through the lens of evolution, for evolutionary ideas exclude the interaction, involvement, and/or guidance of a supernatural deity. The EAV Bible offers a shocking glimpse into what the Bible would be like if evolution were true and if God used it to create. Thank you for your interest in this project. If you feel strongly about this issue and want to help spread the word, I am more than happy to get EAV Bibles to you at cost. Previous PostIs evolution scientifically valid?Next PostWhy are Evolutionists so Racist and Misogynistic?